The concept of surgically restoring the ventricle to a near-normal physiologic geometry has been the goal of successful treatment of advanced heart failure due to left ventricular aneurysms following transmural myocardial infarctions . The resulting geometry after surgical restoration has concerned a number of surgeons since the first successful repair in 1958, but little attention was placed on the altered geometry until attempts were made to effect a more physiologic aneurysmorrhaphy in 1973. Substantial attention was focused on a concept of geometric reconstruction from within the left ventricle in 1985 . A prosthetic patch was employed with the concept to redirect normal muscle bundles to their original orientation and position. Further refinements include use of improved materials for the repair, preservation, and bypass of the left anterior descending coronary artery, ablation of ventricular arrhythmias when indicated, and the absence of prosthetic material used in contact with the pericardial surface. 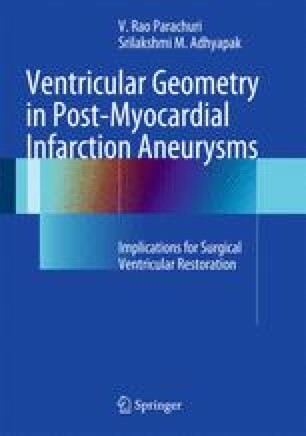 The previous chapters have dealt with the innovations in surgical technique which has led to an evolution toward greater normalcy in the restored ventricular geometry.